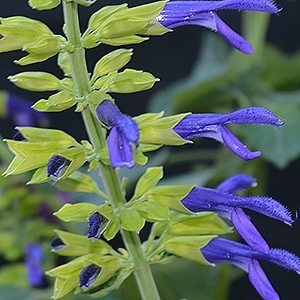 With a lime green calyx, followed by dark purple flowers Salvia mexicana ‘Limelight’ is one of the more unique Salvias. This cultivar has been around for nearly 50 years, however it never ceases to interest gardeners. Flowers appear on upright spikes above the foliage, the lime green calyx first and then the purple to deep blue flowers appear. 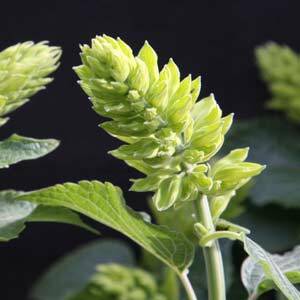 This is an excellent Salvia to add contrast and texture to the garden border and it will grow in full sun to part shade..
Salvia ‘Limelight’ will send up multiple stems from the base of the plant. Over time the plant will form a larger clump and will need to be divided every 3 – 4 years to maintain a compact size. Best planted in a sunny position in a well drained soil. New plants should be watered in well and given a little additional water through the first summer. Try not to overwater as this can weaken the stems of the plant. Salvia ‘Limelight’ can be pruned back hard in spring. Spread 1.6 metres, over time it will form a larger clump. Foliage – Large mid to dark green. Flowers – Lime green Calyx with contrasting purple flowers. Flowering period – Late summer through autumn. Easy from cuttings and also by basal division of established clumps. Best divided in early spring.